If you are here, it’s very likely because you like to make things. You know that the rewards of working with the hands are inestimable, and satisfying in a way that the other job – the desk job, the cubicle job, the production-line job, the housekeeping job – cannot quite match, critical though they may be for keeping the wolf from the door. So, this week, we look at those who make, and who make … it … slow. Gridjunky is a master of slow craft. An upcycler, he goes through the trouble of collecting old jumpers with good yarn, patiently unravelling, then washing and skeining them again for reuse in his knitting projects. His slow sewing projects with thrifted jeans and fabric are also quite something to behold, featuring sashiko techniques and hand-stitched hems that give the work an unparalleled finish. Thrifted/vintage tweed, some of them Harris. If you are a blanket or quilt maker, you may have encountered Chawne from Completely Cauchy in your travels. Her work is so fresh, bright and painstaking, and her eye for colour is unmatched. Awe-inspiring. Crochet lovers already probably know of Cypress Textiles. If you don’t, have the crochet hook and yarn ready first, because this site will get your brain whirling. Lots of patterns, lots of step-by-steps, lots of ideas. Victoria Pemberton is a one-woman show in Melbourne who runs Bind | Fold, which offers plant-dyed textiles and yarn and indigo shibori. One of our favourite designers is Hannah Fettig, whose book Coastal Knits is instore. She is the creator of the much loved Featherweight Cardigan, and we can’t wait to see her new book, Home & Away, soon. How lovely is that jumper on the cover? Have you seen Swedish artist Camilla Engman’s work? Her blog shows the extraordinary in the everyday, and also her whimsical, insightful and more than a little humorous illustrations. For book lovers, the Penguin Threads are a must. These special editions of classics such as Little Women feature cover art by Jillian Tamaki and Rachell Sumpter. The illustrations are hand-stitched in needle and thread, and the finished books are embossed for a tactile finish. And guess what’s on the inside of those covers? The reverse side of the cover gatefold. 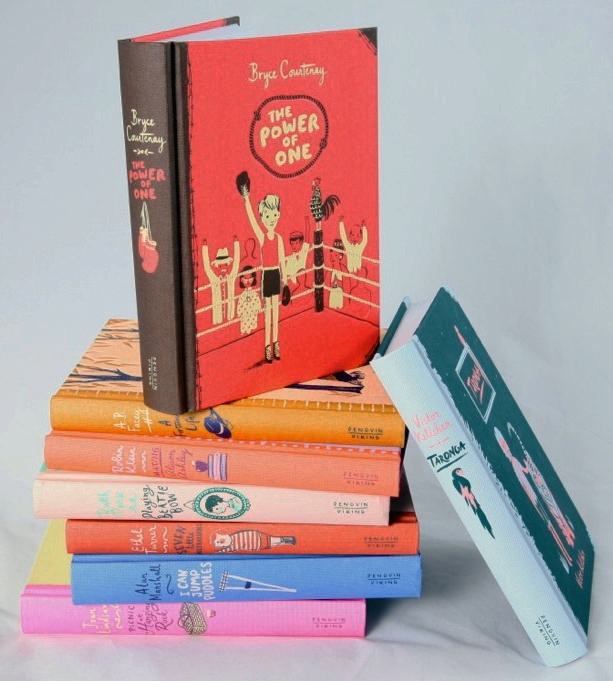 Another series worth noting are the keepsake editions, designed by Allison Colpoys, of the Penguin’s Australian Children’s Classics, which include treasures such as Seven Little Australians and I Can Jump Puddles. And finally, a reminder that the Hand Knitters Guild will be holding their annual yarn and craft market at the Coburg Town Hall, 90 Bell Street, on Saturday, 23 May from 10 am to 3 pm. See, touch and purchase yarns from small suppliers around Victoria, including Ixchel Angora Fibres & Yarns; Nanny’s Spin on Things; Dyed By Hands Yarns; Cat & Sparrow; Lara Downs; Spin Addict (Fibres of the Yarra Valley) and more plus assorted Guild member’s stalls. Entry is free. Categories: blankets, Crochet, Knitting, quilting | Tags: completely cauchy, cypress textiles, gridjunky, hannah fettig, harris tweed, Isager, links, penguin books, upcycling, woollenflower | Permalink.